October 1940. 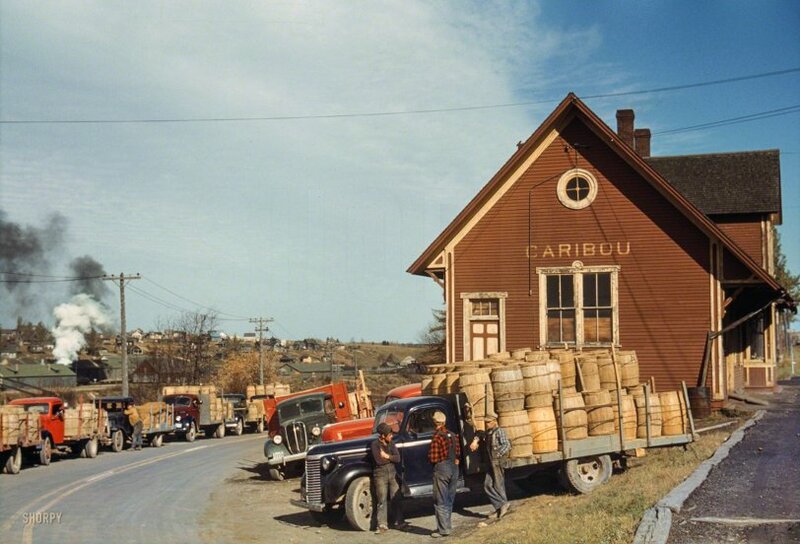 "Trucks outside of a starch factory, Caribou, Aroostook County, Maine. There were almost 50 trucks in the line. Some had been waiting for 24 hours for the potatoes to be graded and weighed." 35mm Kodachrome by Jack Delano for the Farm Security Administration. View full size. Submitted by Bink on Tue, 06/14/2016 - 7:48am. Submitted by PersonFromPorlock on Mon, 05/23/2016 - 8:50pm. The building is the Canadian Pacific RR station in Caribou. I found one photo of it. I'm not sure exactly where it was, except across the river from Caribou's railway yard. The CP tracks (long gone) ran along the east side of the Aroostook river; the buildings in the background are on the west side, which is where most of Caribou is. The still-extant tracks on the west side (if you're looking at a map) belong to the Bangor and Aroostook RR. Submitted by MaltedFalcon on Wed, 05/18/2016 - 3:24pm. The starch factory is the grey buildings behind the trucks to the left. it burned down. Bangor News, Feb. 24, 1983. Starch factory or train depot? Submitted by oldphotolover on Wed, 05/18/2016 - 6:22am. Despite what the caption says for this photo, the structure with the word "CARIBOU" on the side sure looks to me like an old train depot. The tracks aren't showing, of course, so hard to tell. Maybe it is a former train depot that has been converted into a starch factory. Anyone else agree? Submitted by OTY on Tue, 05/17/2016 - 1:27pm. Just yesterday, May 16, I saw on the TV news that Caribou, Maine, had freezing temps and up to 6 inches of snow. I know it is not unusual for them to have snow in October either. Maine is a beautiful state and I love potatoes, but I'm too old to deal with seven months of snow.